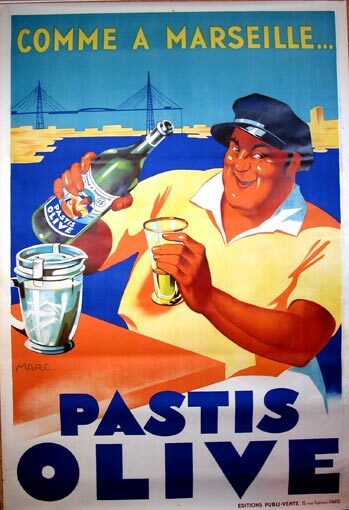 If I must be informative and put forward unbiased information, I should simply say that pastis is an anise-flavored liqueur, consumed mainly in France, particularly in the south: this is why one can call Marseille the Pastis Capital of the World. This liqueur is of a green color, and it is usually consumed after mixing it with water and perhaps a couple of ice cubes. Once this liqueur comes in contact with water, it turns into a milky green color, much like absinthe does/did. The latter has been illegal in France for decades, but pastis came out and was marketed since the early 20th century as a replacement for the banned absinthe. Pastis looks like absinthe, but it’s makeup is different: it doesn´t have wormwood, the hallucinogenic ingredient that drove many an absinthe-drinker crazy. But, since this is my blog and I am biased, I must tell you that pastis is a disgusting smelling and tasting liqueur, that is mostly consumed in this region of France. To my disdain, Minou (nickname for my Marseillaise boyfriend) has a glass of this revolting liqueur regularly, as an aperó (costume I will go into detail about later in another post), and the smell – to me – is so vomit-inducing that I simply cannot even kiss him. It’s a sort of tradition in these parts, and the more you love pastis the more “Marseillaise” – and inherently manly – you are. Most Marseillaise men smell like pastis. If you love pastis, there’s a 99.9% that you also love the football/soccer team Olympique Marseille (OM). They claim it has no wormwood and that it´s not absinthe. But Marseillaise people are so crazy you would swear pastis is no different from absinthe. The most famous brand of pastis is Ricard, because Mr. Paul Ricard was who “invented” it and the first one to commercialize it. You can find it at many liqueur stores in the US if you care to try it. If anything anisette or liquorish-flavored ever revolted you, be sure that pastis is not for you. Pastis is sometimes mixed with fruit-flavored syrups – such as orgeat, grenadine, banana or strawberry - and made into cocktails that are supposed to make pastis slightly less disgusting. It’s mainly a Provencal and Pied-Noir tradition. But, if you come for a visit to Provence, I believe that trying a pastis at your local bar -as well as playing some pétanque with the old folks – is a must. Have you ever tasted it? What do you think about it?